Business Startup Expert - Business Startup Expert is an all-in-one software program that provides you with the tools needed to start and manage a successful business. Build A Business Plan - Build A Business Plan is an all-in-one software program that provides you with the tools needed to start and manage a successful business. Business Card Studio - Powerful ease-of-use tool for designing nice looking templates of business cards. With its help you'll be able to create custom cards composed of various graphic shapes. Business Hints For Men And Women - Business Hints For Everyone is a set of laws for success in enterprise undertakings. The book lays out the laws of business and work as previously unknown to many people. Small Business Consultant - Small Business Consultant give businesses that need to grow revenue and generate more profits the tools to improve their financial performance. Business Turnaround Expert focuses on helping businesses increase revenue and reduce expenses. Cartmeister - Cartmeister is a tool for creating business cards, IDs, badges and other cards for business or personal use. You can create and print full color business cards in minutes. Rich image Gallery. No additional software required. Newlite Business Card Printer - Newlite Business Card Printer is a feature-rich cool and high quality business card designing and printing software. This helps you create the perfect business cards you need and print them right-away on your own printer. 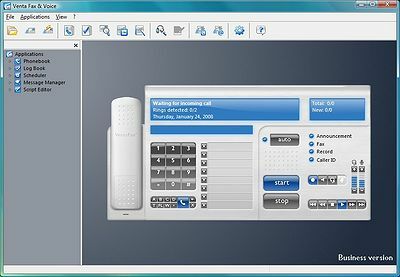 Venta4Net - Network fax and voice messaging solution for sending and receiving faxes and voice messages from any networked computer via a modem (or modems) installed in the server computer. Single line and multi-line versions available.